Syria To “Strike Tel Aviv Airport” Unless UN Does Something About Israel’s Aggression – Coercion Code – "Dark Times are upon us"
Syria has threatened to strike Israel’s Ben Gurion airport in Tel Aviv unless the UN Security Council ends years of IDF incursions into Syrian airspace, according to Syria’s UN Ambassador Bashar al-Jaafari. Israeli forces conducted several strikes in recent days on alleged Iranian facilities within Syria, including a rare daylight raid on Syria’s international airport south of Damascus, which the Assad government responded ti with a surface-to-surface missile, according to the Times of Israel. 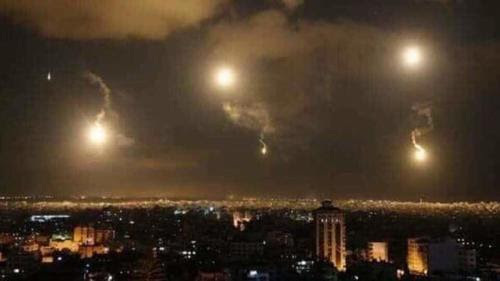 Israel’s Sunday night attack involved dozens of strikes reportedly from F-16 jets flying over Lebanon targeting locations in and around southern Damascus. Syria’s Pantsir and Buk air defense missile systems reportedly shot down an unknown number of inbound Israeli rockets according to early unconfirmed video. In total, 21 people were killed in the exchange, including at least 12 members of Iran’s Revolutionary Guard, according to i24 News, citing watchdog reports. Israeli air raids in Syria have repeatedly endangered airline flights operating over the region – endangering two civilian aircraft on Christmas day while engaging Syrian targets, according to the Russian Defense Ministry, which added that the IDF F-16s approached as civilian jets were landing at Damascus and Beirut airports. Moscow chimed in on Wednesday as well, calling for Israel to halt what Moscow described as arbitrary air strikes on Syria. “The practice of arbitrary strikes on the territory of a sovereign state, in this case, we are talking about Syria, should be ruled out,” said Russian Foreign Ministry Spokeswoman Maria Zakharova, responding to a question from Russian news agency TASS about the recent Israeli strikes. “We should never allow Syria, which has suffered years of armed conflict, to be turned into an arena where geopolitical scores are settled,” she added. In September, 15 Russian servicemen were killed after Israeli jets used a Russian II-20 recon plane as cover to place it in the path of a Syrian air defense missile. “The restoration sovereignty of the occupied Syrian Golan is a permanent right of Syria that [is] not subject to negotiations,” added al-Jaafari. Israel began occupying the Golan Heights from Syria after the 1967 Six-Day War – refraining from extending sovereignty over the region for more than a decade until the Jewish state annexed the area in 1981. Syria has repeatedly argued that the Golan heights is their territory, and had demanded it back. “Israel will remain forever on the Golan Heights, and the Golan Heights will forever remain in our hands,” said Israeli Prime Minister Benjamin Netanyahu in November.